SK Engineering and Construction Co. received an order to build a gas plant in Wasit, Saudi Arabia, for $2.5 billion jointly with Samsung Engineering Co. from Aramco, the state-owned oil company in the Middle East kingdom, the company announced recently. The gas plant project is divided into four packages including the construction of a gas treatment facility, the utility facilities and a liquefied natural gas treatment plant. SK Construction got three packages worth $1.9 billion while Samsung Engineering secured the project to a build power plant worth $600 million, according to the announcement. The Wasit gas plant will be built along the seaside of the Persian Gulf some 50 km from the Jubail industrial complex and when completed will produce 70 million cubic meters of gas per day. Both SK and Samsung received the orders on a turnkey basis, taking charge of everything from design and purchase to construction, with the completion date set for 2014 ― giving the firms 38 months to finish the projects. 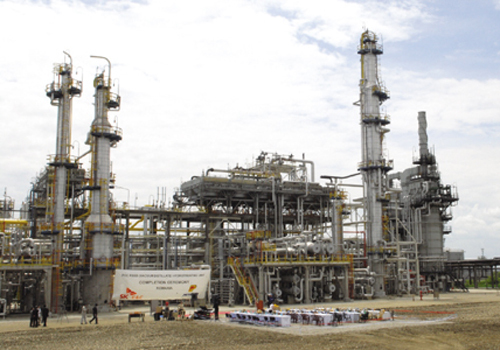 SK Construction entered the construction market in the Middle East kingdom in 2009 with a project to build an oil refinery in Jubail for $500 million. Last year the company got additional orders including the Anbu oil refinery construction project worth $600 million and the project to build the King Abdullah Petroleum Research Complex worth $300 million. SK E&C signed a contract with JAC (Jurong Aromatics Corporation Pte. Ltd.) in Singapore for the large aromatics plant construction project. The construction cost is $950 million, making it the largest contract that a Korean company has ever won in Singapore. This is a construction project to build a large-scale aromatics factory on the 550,000㎡ site in the petrochemical industrial complex on Jurong Island. SK E&C will carry out the project on an EPC (engineering, procurement and construction) basis. The construction period is 36 months and when the project is complete in 2013 the factory will be able to produce 800,000 tons of paraxylene as well as over 4 million tons of aromatic products and other petrochemical products including benzene, orthoxylene, etc. SK E&C won the contract for this project in October 2007, but the project was suspended as the global financial situation deteriorated. Amid the global financial crisis, SK E&C and JAC (Jurong Aromatics Corporation Pte. Ltd.) made continuous efforts to resume the project. With the new shareholders and the participation of Korea EXIM Bank, Korea Trade Insurance Corporation and global financial institutions such as the Royal Bank of Scotland and ING, the project financing became possible after three years. As a result, SK E&C has been given the opportunity to carry out the largest construction project ever won by a Korean company in Singapore. SK E&C won the first overseas communication contract to build a communication system in Qatar worth $34 million. This project is to construct a communication system between oil refineries and petrochemical plants in the Dukhan oilfield, located 95 km west of Doha, the capital of Qatar. Qatar Petroleum, a national petroleum company in Qatar, placed this order with a construction period of 30 months, slated for completion in April 2013. In the 1,500 km2 Dukhan oilfield there are currently 81 oil refineries and petrochemical plants belonging to Qatar Petroleum. SK E&C will replace old communication equipment in each facility and build a state-of-the art IT system for better communication among facilities as well as strengthened security and closer management of the facilities. Winning this contract is significant in that SK E&C has pioneered a new market in construction on the basis of its achievements in plant EPC.